Winter is coming. As it gets colder, we just stay in our homes with blankets and snacks. However there are several places in Seoul where we can spend our time in a warm and cozy atmosphere with our significant people. 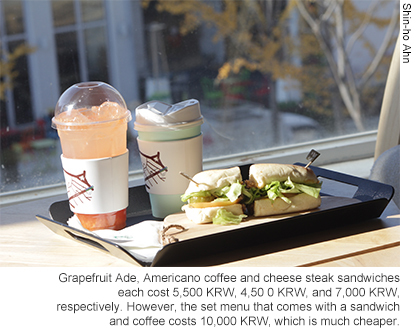 In The UOS Times, we will introduce these several “cafe streets” in Seoul, because they are really fancy and have a great atmosphere. So you can visit these cafes in the winter and have a great time. 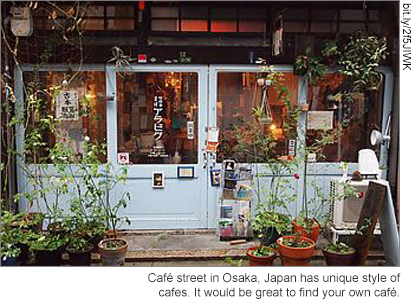 As written about in many blogs or magazines, there are lots of theme cafes or cafe streets around the world. For example, in New York there are a lot of open-air cafes. 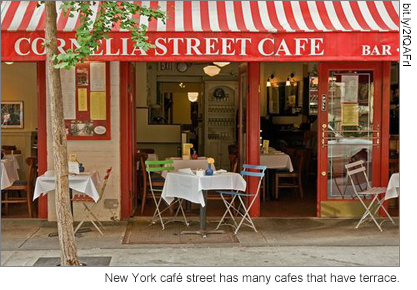 The government restricts the roads where cafes are built, so New York’s cafe streets are very organized and clean. 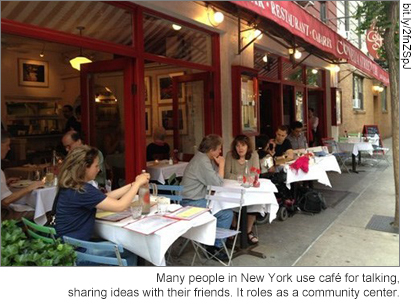 Also, many people in New York meet in these cafes, and they serve a great role as community centers in New York City. 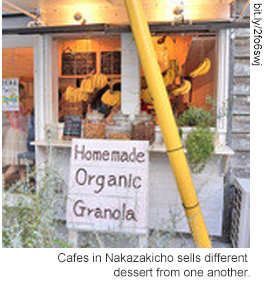 In Osaka, Japan, there is a Cafe Street called “Nakazakicho Cafe Street.” It is far from the center of Osaka, so it has its own rural atmosphere. Most cafes on this street are made of remodeled old Japanese houses, so visitors can observe how old Japanese houses looked. Also, each cafe sells different styles of deserts and drinks, so finding your own cafe will be a great experience. 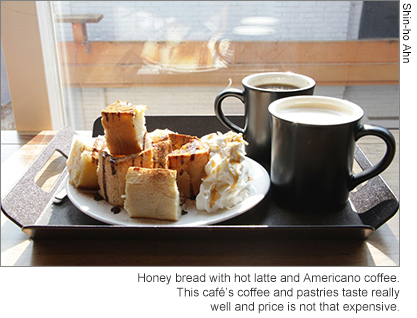 Like the cafe streets in other countries, Korea has cafe streets that each have a special theme. 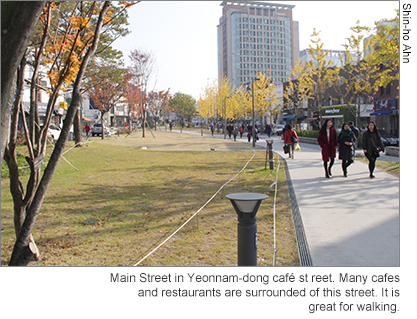 In this issue of The UOS Times, we will introduce the cafe streets in Yeonnam-dong, Sangsu-dong, and Seogyo-dong. Each cafe street has its own specialties, so visit one of them if they seem to really suit you. 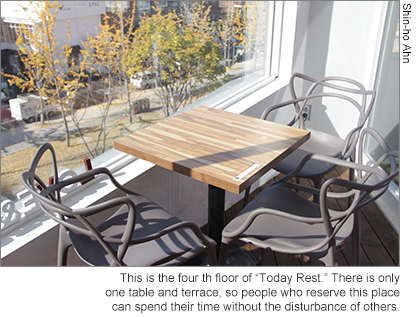 Yeonnam-dong Cafe Street is located in Gyeongui Line Forest Park. When you come out of Exit 3 of Hongik Univ. Station, you will see Yeonnam-dong Cafe Street immediately. 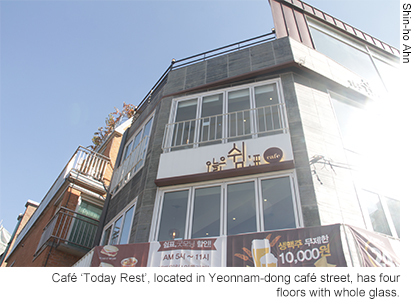 Many cafes and restaurants are on Yeonnam-dong Cafe Street. These places have a romantic atmosphere that attracts a lot of couples. 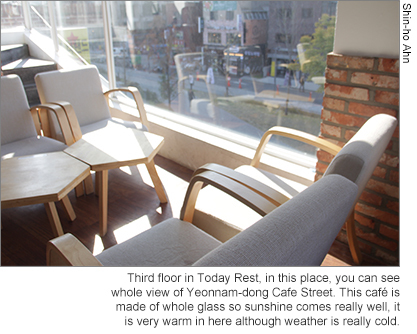 The UOS Times visited one cafe, “Today Rest”, which has a great view and a warm and cozy ambience because it is made almost entirely of glass. When you come out of Exit 3 of Hongik Univ. Station and go straight, you will see it easily. “Today Rest” opens 24 hours, so you can visit whenever you want. Unlike other cafes that only sell coffee or something drink, Today Rest sells wine and beer too. As mentioned above, because it has a great view, this cafe will give you great memories if you drink wine with your friends or significant other there. 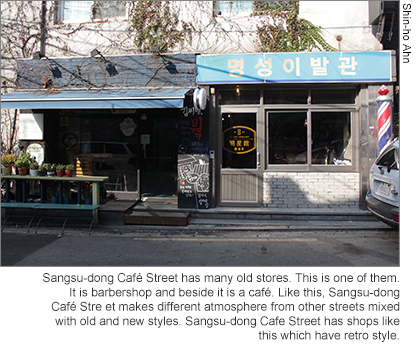 When you come out of Sangsu Station, there is Sangu-dong Cafe Street. 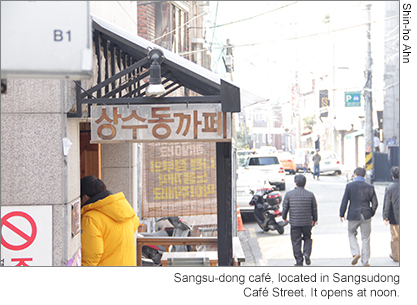 If you walk for 10 minutes outside of Exit 4 of Sangsu Station, you will see the entrance to Sangsu-dong Cafe Street. Several shops and cafes are located starting from the GS 25 convenience store. 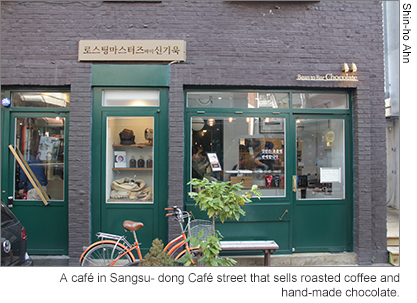 Sangsu-dong Cafe Street is very special and has a vintage atmosphere because old shops, such as barbershops, and new shops, such as cafes and clothing stores, are mixed together. We visited a cafe named ‘Sangsu-dong Cafe’. This cafe is popular for its hand-drip coffee, hot chocolate and brownies. 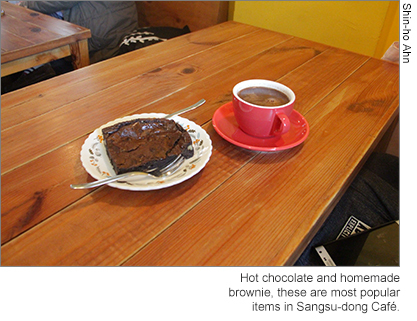 Sangsu-dong Cafe’s hot chocolate is homemade. Also, unlike the hot chocolate made in most other cafes, which is made from chocolate powder, the hot chocolate in this cafe is made from melted chocolate. In addition, there are various teas that are made by the owner of the cafe. This place is really small (it has only four tables), so it has a really warm atmosphere. As mentioned above, there are other stores, shops and restaurants on Sangsu-dong Cafe Street. To have more fun, we will tell you about a restaurant on Sangsu-dong Cafe Street. This restaurant is called “Sangsu-dong Blues” and sells pasta, salad and other kinds of food. This restaurant is popular for its signature menu item, Scweinshaxe, a German pork dish. If you want to try this food, you should reserve it before you visit. 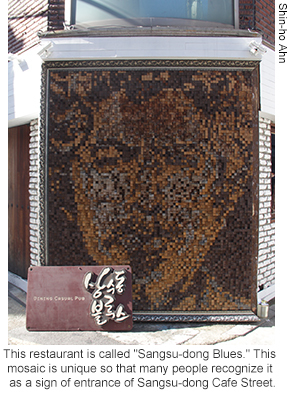 Unlike other streets, Seogyo-dong has specially themed cafes. You can find several book cafes on this street. Most of them are run by publishing companies that are located near this cafe street. 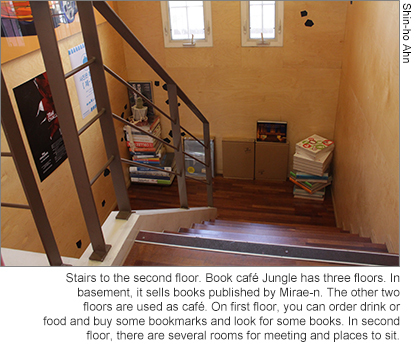 We visited a cafe named ‘Jungle’ that is run by the publishing company “Mirae-n.” This cafe has four floors, including a basement. In the basement, a large amount of books are sold, so anyone can look around and buy them. Also, there are several rooms in the cafe to hold study groups and seminars. Mira-n made this cafe to sell books specifically related to design and interior design, so this cafe has a large amount of these kinds of books. People can read any books they want, but they must be careful not to take photographs of them. 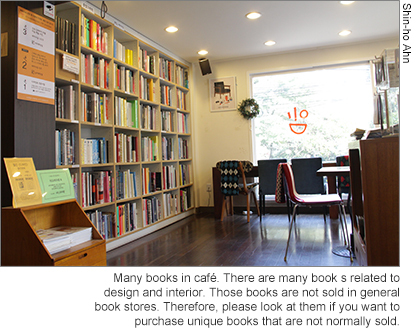 Therefore, if you are interested in design, in this cafe you can buy books that are not sold in usual bookstores. Also, a cat lives in this cafe. 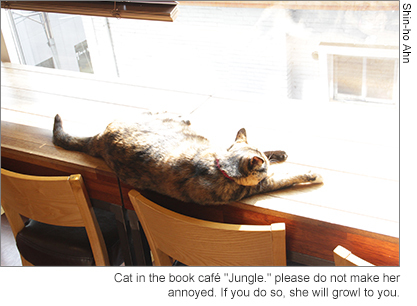 She is named after the cafe: Jungle. You can pet her or take pictures of her, but be careful not to annoy her because she is a little moody. 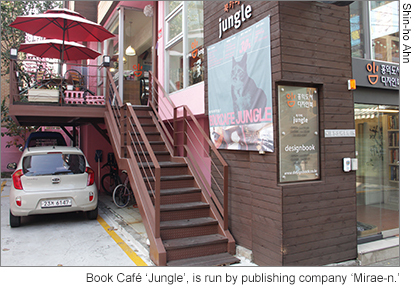 In Seogyo-dong, there is another book cafe run by a publishing company. It is called “Cafe Changbi” and is run by the publishing company “Changbi.” It has two floors, and on the first floor you will see free books published by Changbi, like library. It also has tables for one person, so you can use this cafe as a library. In addition, it sells sandwiches, baked breads and beverages. In the basement, there is a big conference room. Changbi sometimes hosts conferences and lectures here, so contact them if you are interested.